This would go on to be one of the founding wineries in what is now the Prosser Vintner's Village. 2006 was the first year that the Olsen family crushed grapes for their own label, after more than a quarter century of growing grapes for a variety of Washington producers. Sadly, 2009 was the last year that they made an Olsen Estates wine. No grapes were crushed in 2010, and the winery and all of its remaining inventory is being sold off. It’s a loss not only for the Olsen family, whose dreams and dollars were poured into the enterprise, but for the entire Washington wine industry. There can never be enough quality wine grape growers in any wine region (happily, the Olsens – now in the fourth decade of grape growing – will continue with that). As this recession has dragged on over the years, those in the wine industry, like so many others, have had to make some very difficult adjustments. It is a business with a high cost of entry. It takes many years to build, unless you are simply buying juice and slapping a label on it. It is extremely competitive. And for consumers, wine is an optional purchase. Anyone who has been paying attention has seen the deluge of cheap wines hitting the shelves. Some wineries have actually prospered by offering affordably-priced wines sourced from grapes once intended for the luxury bottlings. But not everyone is able to be that nimble. Not every business plan is easily adaptable to the new realities. I spoke by phone with Larry Olsen, who, along with his brother and other family members, founded Olsen Estates, and asked him if he’d be willing to share his thoughts on how and why the winery failed. He generously offered this advice. Difficult lesson learned, and a bitter pill to swallow. But my hope, and Larry Olsen’s hope, is that others will benefit from his hard-won knowledge. I urge you to seek out and savor the last of the Olsen Estates wines. Here are some recent favorites (and my Wine Enthusiast scores and reviews) to get you started. I list the original prices, current retail may differ. 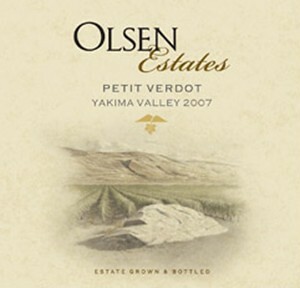 The best of Olsen’s 2008 reds, this 100% Merlot is generous and forward, with rich cherry and raspberry fruit. Spicy in the nose and in the mouth, it is lightly herbal – adding texture and length – and has the concentration and depth to develop nicely over the next decade. A six grape Rhône blend, this does not lose focus or intensity. It strikes the palate head on with flavors of dried leaf, prune, cooked cherry, cinnamon and mocha. But despite the raisin/prune flavors, it does not seem over-ripe or in any way over the hill. Rather, these super-ripe flavors have somehow been tamed, the alcohol is just over 14%, and the wine leaves a sinuous, sensuous trail of flavor as it moves through the palate. Smooth and supple, almost silky, this dense and delightful Syrah begins with a smoky, meaty run of sweet cherry and berry flavors, then quickly adds interesting nuances of herb and leaf and earth. The cherry fruit triumphs, along with cut tobacco and a whiff of clove, as it weaves through a long finish. This is pure Petit Verdot, substantial and muscular. Scents of violets and purple fruits bring extra nuances of mushroom and moist earth. There is a hint of animal, and a tight core of purple fruits. Tannins are supple and well-managed. Fully botrytised, 46% residual sugar, from 30 year old vines, this is an unctuous, TBA-style dessert wine. Honeyed and decadently rich, it soaks its peach and apricot fruit in a thick wash of honey and caramel, streaked with mocha and lightly scented with jasmine highlights. The alcohol is just over 7%. Should age for decades. Paul - While this doesn't come as a huge surprise (rumors have been swirling for months), that doesn't lessen the sadness. I contend that some of the best potential for value wines from Washington come from these long-time growers who get into winemaking late: the Andrews family at McKinley Springs, David Minick at Willow Crest, and certainly the Olsen Family. To lose such a strong QPR winery is a crushing blow to be sure. And it does indeed underscore the seemingly-common gap between the quality of the wine itself, and the quality of the sales and marketing. It was clear to me, and I'm sure to others in the retail/restaurant channel, that reaching a production level of 5000 cases and expecting to self-distribute was a factual impossibility. The logistics involved with selling and delivering that much wine requires an entirely different skill set. I had hopes, when Olsen signed on with Vinum, that they might be resuscitated, but I guess it must have been too late. The 2007 Olsen Estates Golden Berry Select is one of the finest wines I have tasted from Washington, a stunning value considering it is one fourth the cost of Ste Michelle's Eroica Single-Berry Select. I'm certainly looking forward to tasting the 2008 vintage of that wine, as well as many of the other 2008s and 2009s, but no doubt any future tastings will be tinged with sadness at a winery lost to us far too soon. tis sad indeed - but who can afford to drink wines at those prices?? I'm sure they were wonderful, but - wow -breaks my wine budget! That's too bad - one less good wine to look forward to. I can vouch that it's a tough business right now. With regard to the bargain wines on the shelf, I don't think the Olsen wines were overpriced - but there are a lot of good wines out there in the $20-30 range. There is a reason wines are sold out the winery door into distribution at just under half of retail - selling wine is a lot of work. When you have 800 acres it must be tempting to make 4,000+ cases, but at that level you need to hit the ground running. As you've discussed on this blog in past entries, Paul, the micro-producer can work hard and hand sell to the consumer and the giants can rev up the marketing machinery, but the bigger small folks who need to rely on limited distribution are in a rough market. bobpet - c'mon now - $18 for a 90 point wine is not expensive. And odds are you can find it for less. yes, I know, not everyone can buy an $18 wine, and I often point out wines costing far less as good values. But if you are comparing the $18 Olsen wine with other wines on the shelf, it's a very fine bottle at a very good price. Any chance Full Pull can get a hold of any existing inventory? As a fan of Olsen Estate and Olsen Hills, it is indeed a sad day. Winemaker Kyle Johnson has a great resume so far and with his Purple Star label, t will be great to see him move on. Tim, that was the price I was given when the wines were submitted for review some months ago. Bartell's now is selling the olsen estate red wine cyrah blend for 9.99--a steal at that price and well worth stocking up. You can get Edythe Mae syrah @ Issaquah Costco for $19.99...good juice!